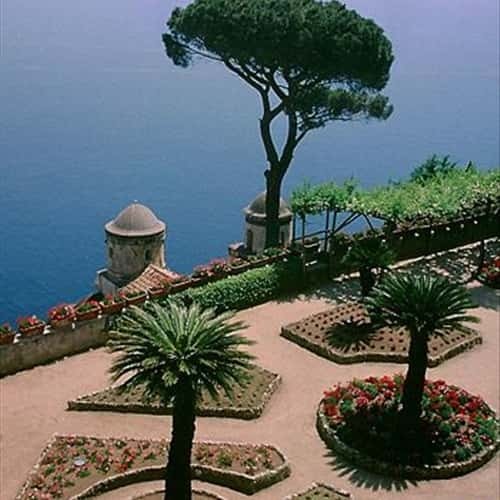 Villa Rufolo is the masterwork in Ravello's extensive repertoire of historical and architectonic showpieces. It bears the name of the family which created it, and at the height of its importance in the 13th century it could boast "more rooms than there are days in the year". Part of this immense heritage has been eroded by time and neglect, but much has been rescued and had new freatures added, primarily by the Scottish industrialist Francis Neville Reid, who owned the Villa at the turn of the 20th century. Whereas the original building was a perfect synthesis of Arabic, Sicilian and Norman architecture, truly unique of its kind, over the best part of a thousand years this monument has had to respond to new demands, resulting in the rather heavy-handed 18th century cloisters, the romantic 19th century gardens, and most recently the facilities for the Fondazione Ravello, the Ravello Festival and the Centro Universitario Europeo per i Beni Culturali. The tour of the Villa begins from the entrance gateway, Torre d'Ingresso, which has always been purely decorative. It is surmounted by a dome with umbrella ribbing, decorated with interlocking arches and supported by small terracotta columns. The Gothic gateway with its pointed arch is adorned with bands of yellow and grey tuff. Togheter with the terracotta columns they create the same polychrome effect that has come to light during recent restoration eslewhere in the Villa, above all wherever the fabric was protected from the elements. Originally all the stone surfaces were covered with a coloured limestone wash to heighten the decorative effect. In the dome of theentrance tower this highlighting was made all the more striking by the use of a transparent straw colour pigment, possibly made from finely ground ceramic enamel. At each corner stands a statue of a human figure representing the four seasons. As you walk down the drive the ancient walls are largely hidden by the luxuriant growth of cypresses and lime trees. 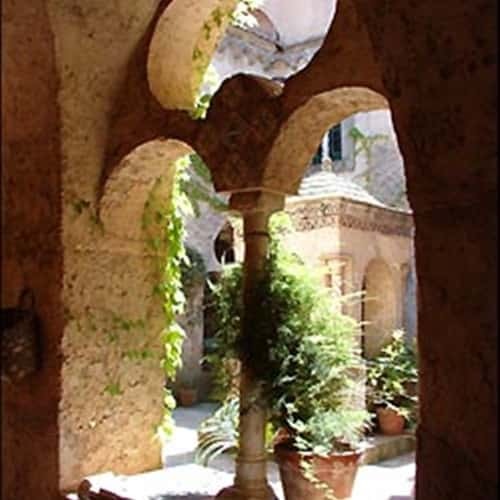 You come first to the Cortile or Moorish Courtyard, originally laid out round three sides but with only thirty-six small columns measuring its full length and two arches with six twin columns on the lefthand side still standing. In the lower tier there are three pointed arches on each side, surmounted by a loggia with twin columns decorated with interlocking foliate arches. The upper tier, fraturingthree oculi on each side, is adorned with a frieze of courpled tortile miniature columns made of terracotta. As you leave the courtyard you climb a few steps to the majestic Torre Maggiore, rising to a height of thirty metres and comprising three floors. This is the oldest extant part of the whole complex, and its remarkable height testifies to the social, economic and political power of the Rufolo family. It affords a commanding view out over both the mountains and the sea. Both the Tower and the Garden pavilion, known as the Sala dei Cavalieri, with its enormous ogives, were constructed following the same architectonic principle. This hall would have been linked to the Tower and to the perimeter walls by means of other strucures which have since collapsed, and only a few traces of their layout remain. Beneath these constructions lies the Giardino on two levels, a garden where the heady sentiment of nineteenth century Romanticismwas given full rein. Its creation and maintenance required a new horticultural expertise, and once established by Neville Reid this tradition has been kept alice tho this day thanks to the descendants of the original team of gardeners. 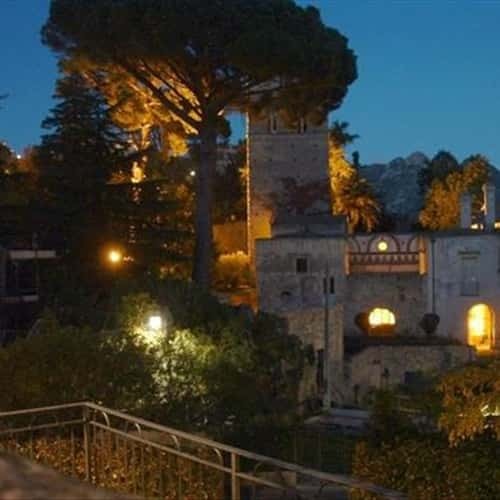 The area around the well or Pozzo, rich in ruins, exotic plants, pines and cypresses is the freature of the Villa that entranced Richard Wagner. 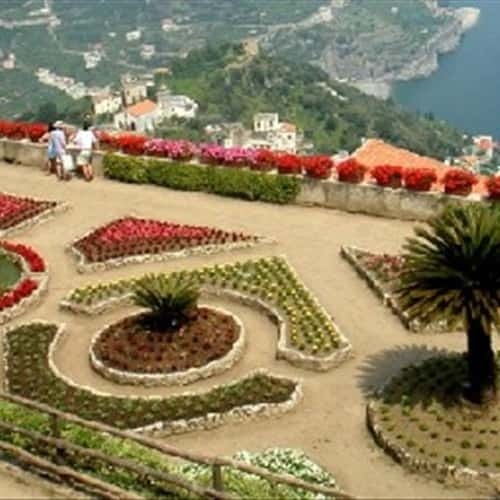 He was moved to exclaim that he had found "the magical garden of Klingsor", for it was the tangible expression of his most fantastic visions. If you walk down the northern side of the garden you come to the remains of the Balnea, the site of baths exploiting mineral springs which were only discovered in the recent excavations. 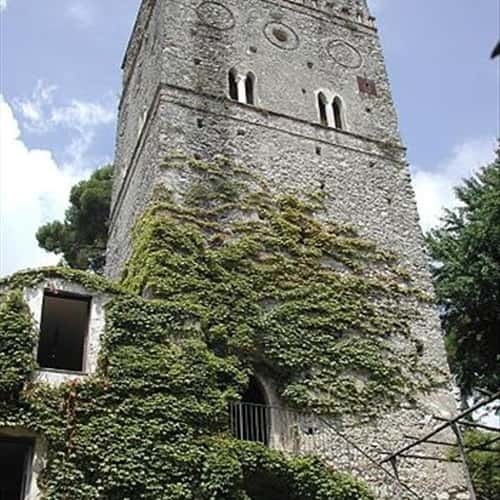 At the foot of the steps leading to the lover garden stood the turkish bath, Bagno Turco, with remains of the water ducts clearly visible and its ribbed dome ceiling still intact. Crossing the garden takes you to a flight of steps leading down to the lowest level of the whole complex. You find yourself in the cellars of the Villa, with a good view of the colonnade standing beneath the Cloister, the structures along its southwestern side now serving as a theatre,teatro. Going back up to the gardens you come to a small enclosure thronged with exotic and venerable plants overlooked by the dining room or sala da pranzo.here the cross-vaulted roof is supported by columns employed singly or in groups of three or four. On the far side of this room a covered passegeway takes you back to the Cloister and the drive leading to the exit. Once outside, if you turn left along the external walls you can admire the friezes, Fregi, adorning the property, now identified as the Cappella. For several months of the year this is the venue for exhibitions of contemporary art and events of all kinds. As you leave the Villa you are sure to take away with you that same sense of rapture experienced in different ages by the Angevin rulers and Boccaccio, Gregorovius and Wagner, Neville Reid and D. H. Lawrence, Jaqueline Kennedy and Hillary Clinton, Gore Vidal and Maurice Bejart.